For one of the biggest wholesalers of event tickets in Austria, the design of the ticket should be able to absorbed and associate with all kind of events. The events range from classical music to pop music and sports. 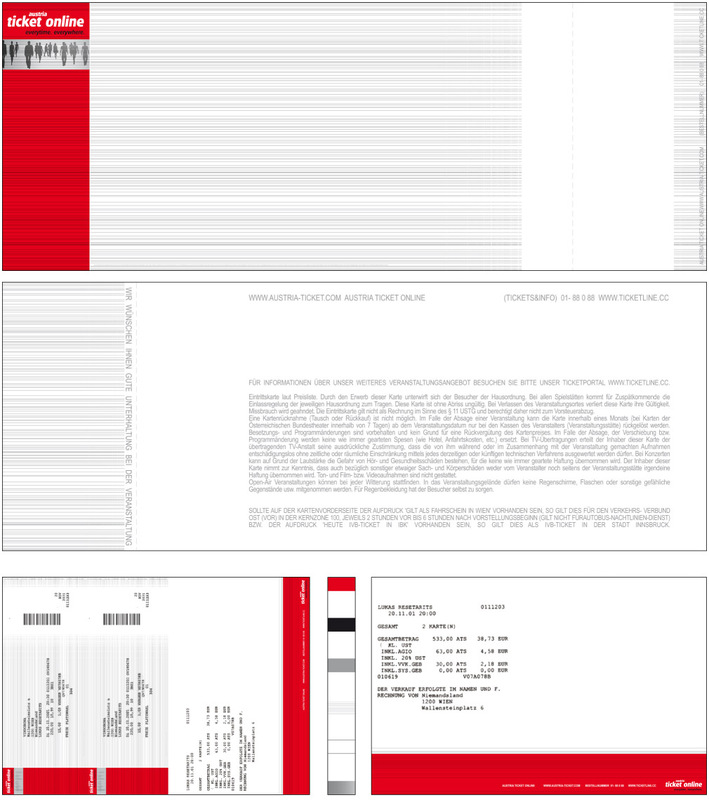 Technically the ticket template has to work for various distributors and printers, the perforation position changes too. The distributor prints the information on the defined places on the template. On the front side the red field is reserved for the distributor logo in black and white, the field with the grey lines is for the name, date and place of the event. On the backside the distributor is printed on the grey stripes. The logo ‘Ticket Austria Online’ was predefined in their corporate identity, such as the red colour. The design includes the following security marks: uv-paint, the grey lines are micro thin lines, a hologram between the red fields, a micro font (a Shakespeare quote on plays). The design was approved, but with the change of the general manager the tickets where realized in a just ‘similar’ design.